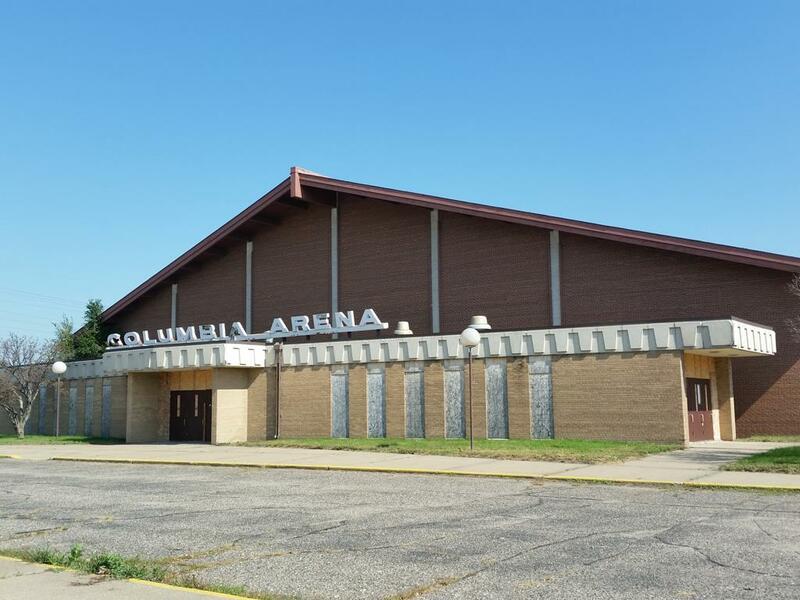 Columbia Ice Arena was formerly located at 7011 University Ave. NE in Fridley, MN. 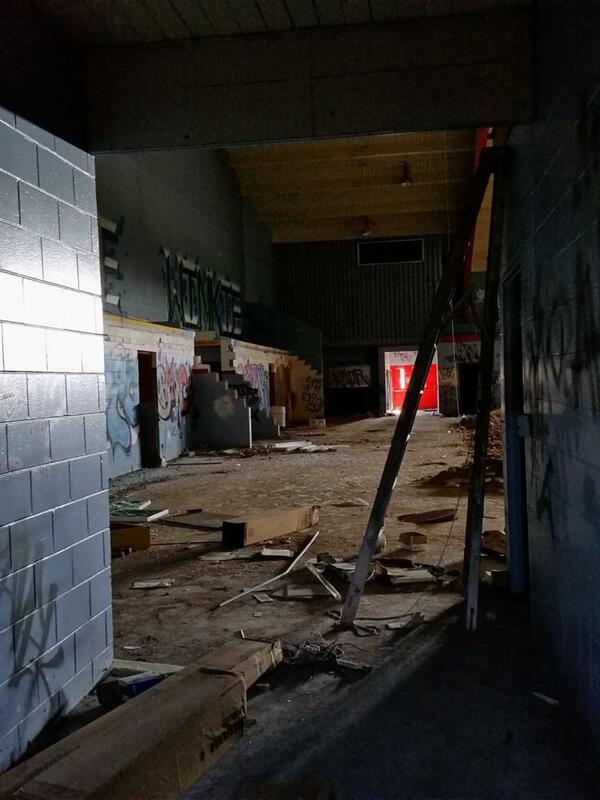 within the rustic Loeke Park just north of Rice Creek. 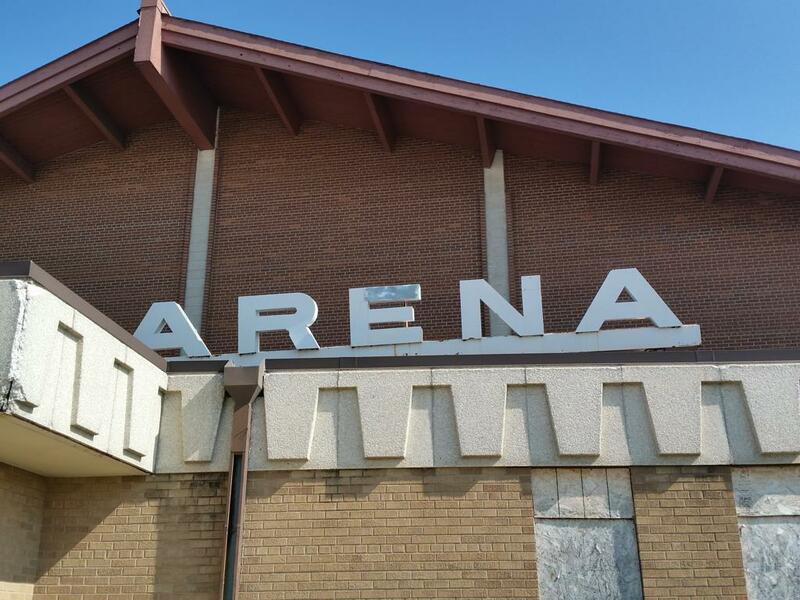 The spacious arena was once the gem of University Avenue where countless youth, collegiate hockey and figure skaters alike honed their skills. 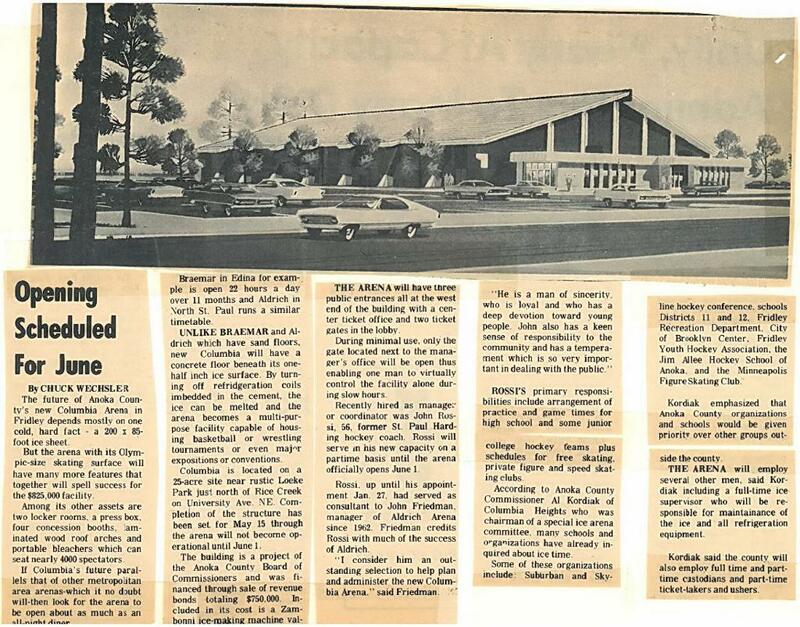 Arena construction began on May 15, 1968 at a cost of $825,000 and was one of only a few Twin Citites arenas that was open for skating throughout the summer months, and was opened June 15, 1969 under the direction of first arena Manager/Coordinator - John Rossi. 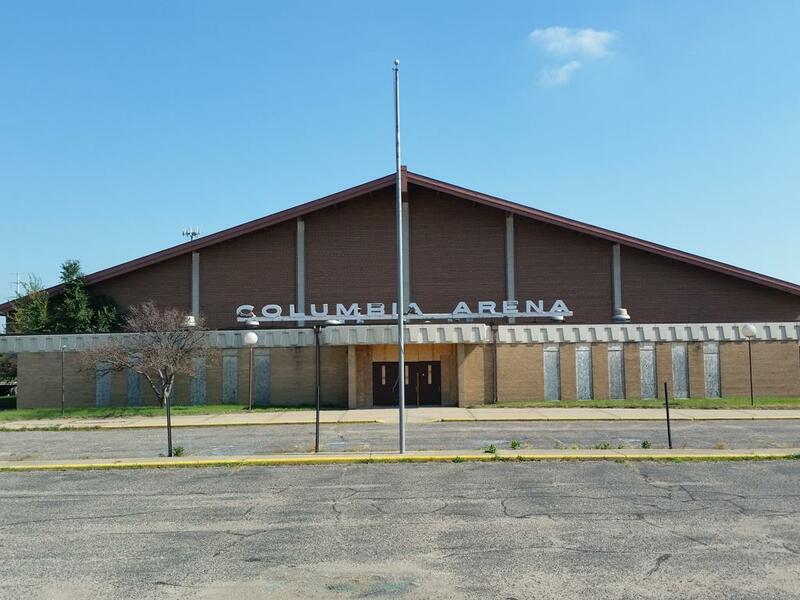 Columbia Arena was designed and built by Roger Patch, of Patch and Erickson of Minneapolis - who was the same designer and builder of 1968 opened Ron Castellano Arena, in Babbitt, MN. 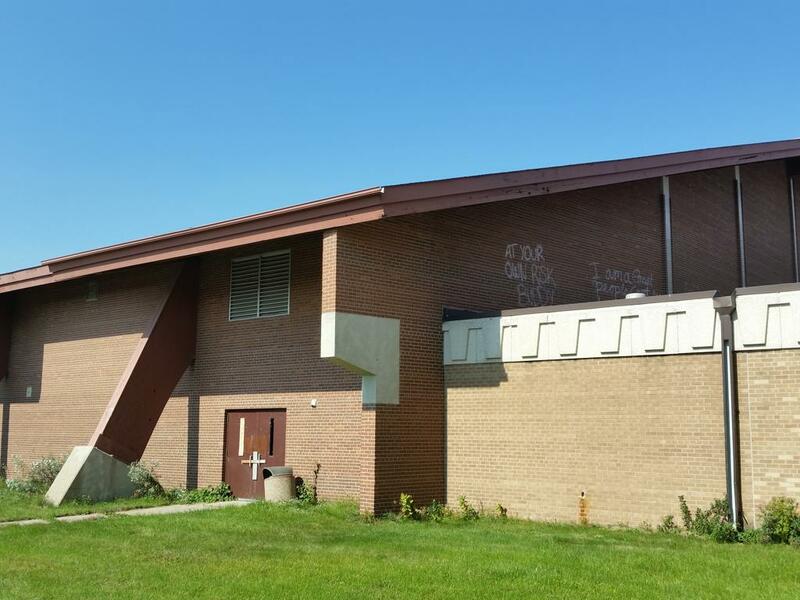 The building was a project of the Anoka County Board of Commissioners and was financed through the sale of revenue bonds totaling $750,000. 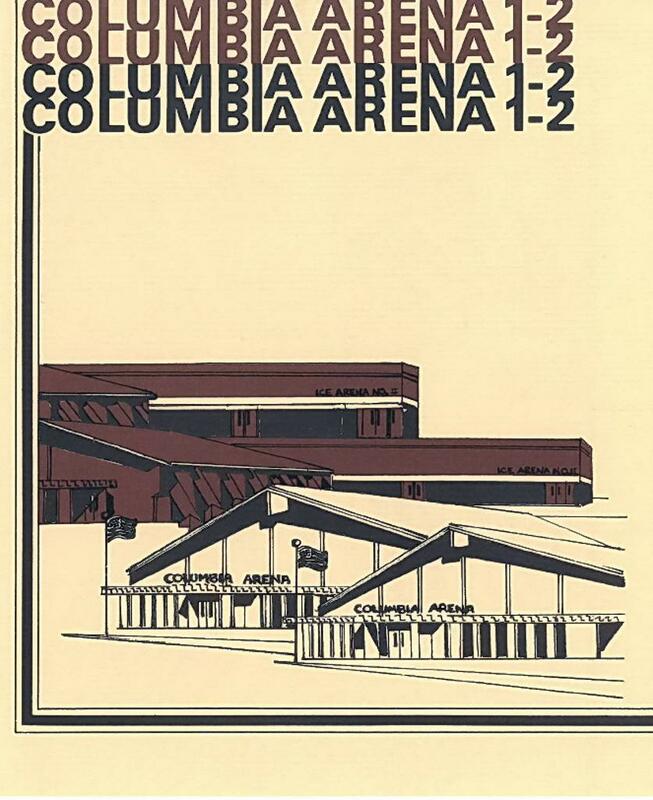 Columbia Arena was open year-round with dry-floor events scheduled throughout the summer. 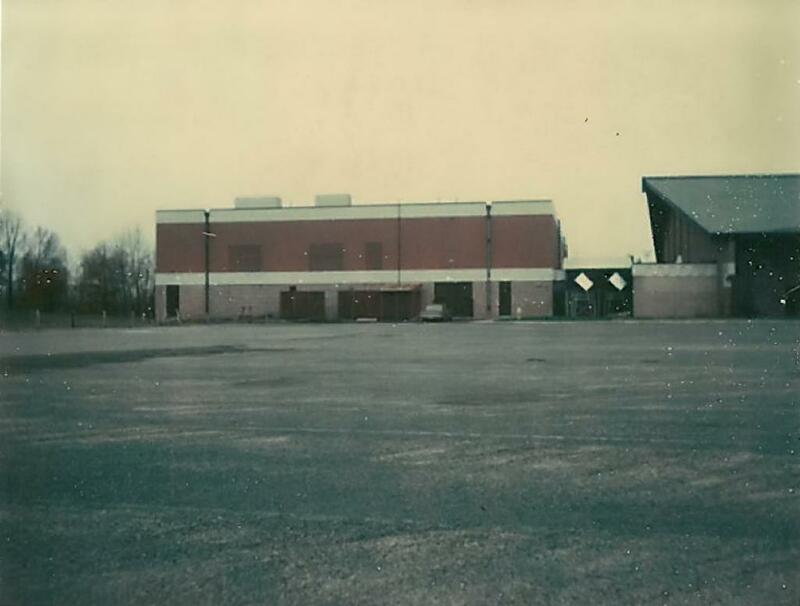 The arena initially had assets of two locker rooms, press box, four concession booths, laminated wood roof arches, and portable bleachers for up to 4000 spectators. 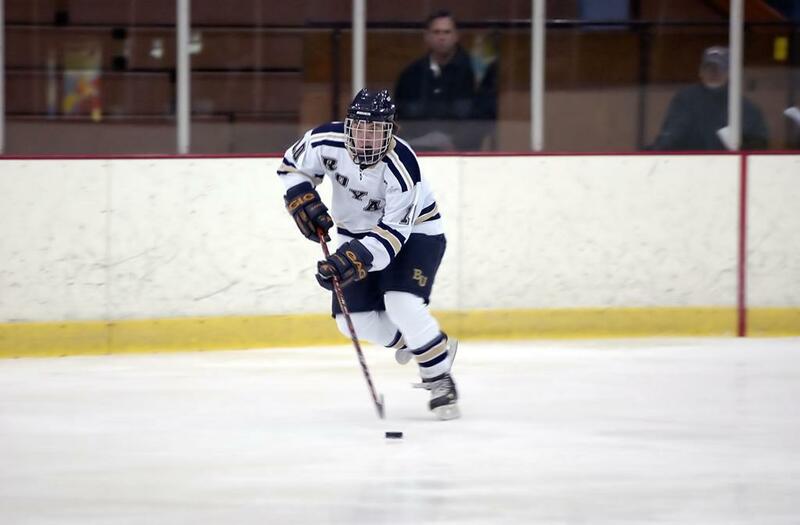 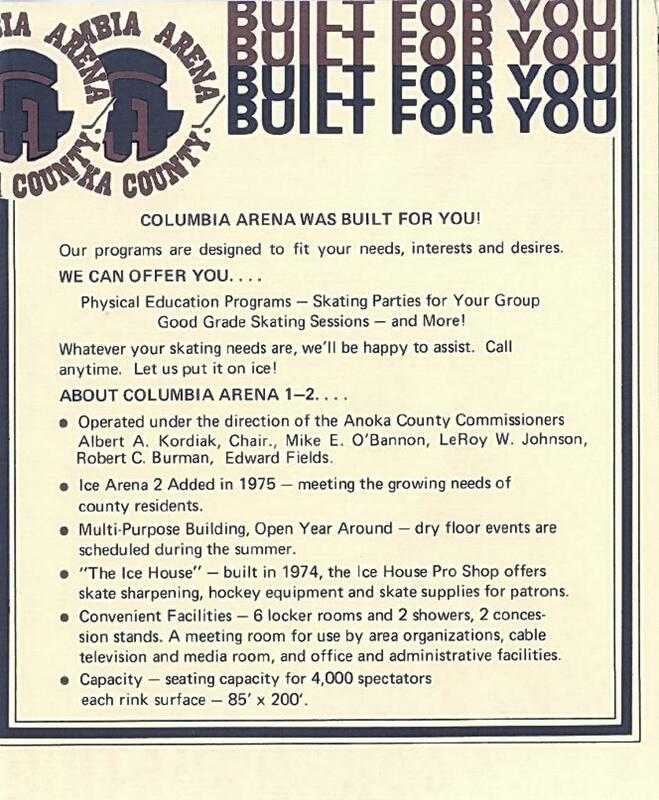 Columbia had one standard 200 x 85 ice-sheet initially, and in 1975, to meet the growing demands of all the youth hockey communities that all utilized Columbia Arena including: Fridley, Spring Lake Park, Irondale, Totino-Grace, Brooklyn Center, Columbia Heights youth and high school programs, and Bethel College/University of Minnesota Intra-Squad Collegiate teams, and the Twin-Cities Vulcans in their final year of existence; Rink #2 was added to the east end of the facility completed by the fall of 1975 at a cost of $790,785 by builder D.J. 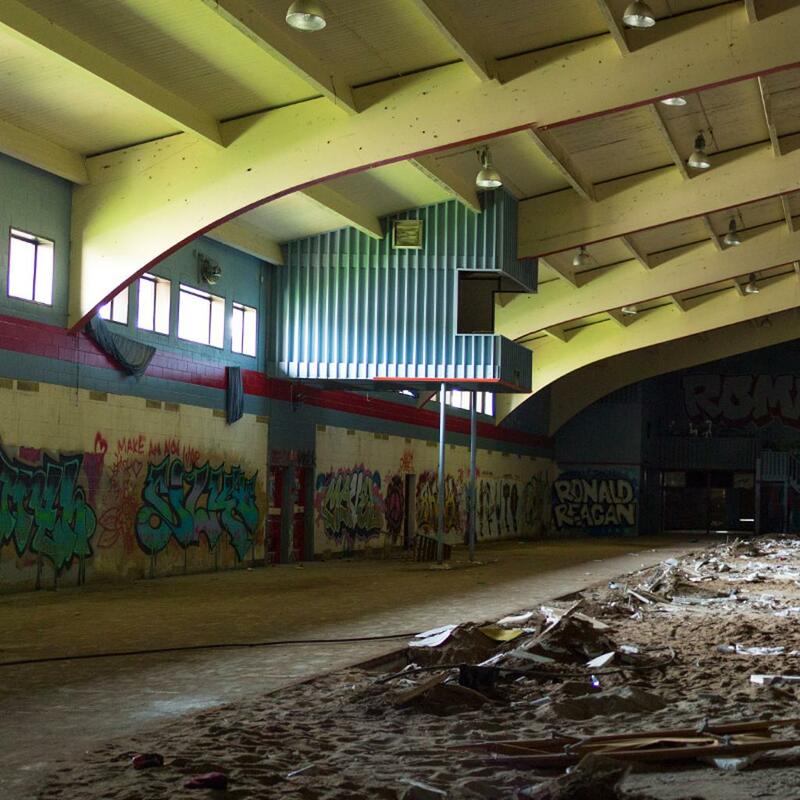 Kranz that had a sand floor with an underground cooling, and also heating system - to prevent permafrost and heaving of the ground that occurred within the original arena. 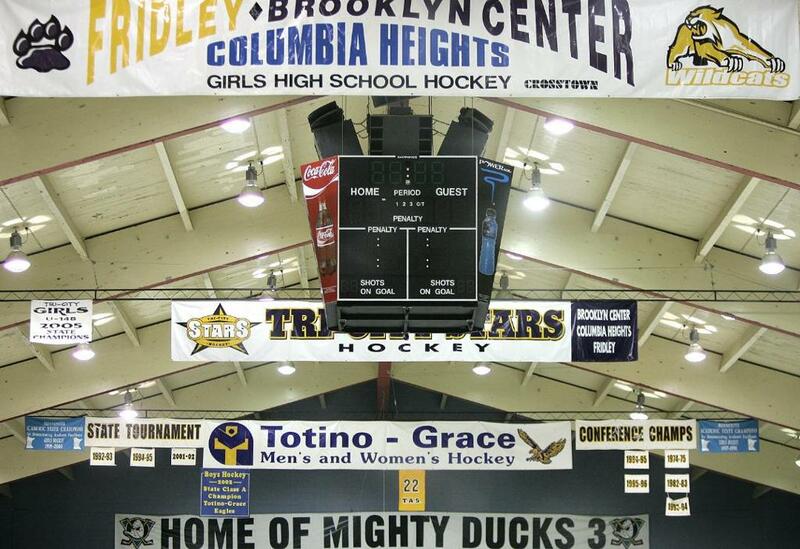 Rink #2 also had a matching 200 x 85 ice sheet, and had seating for 1000 people. 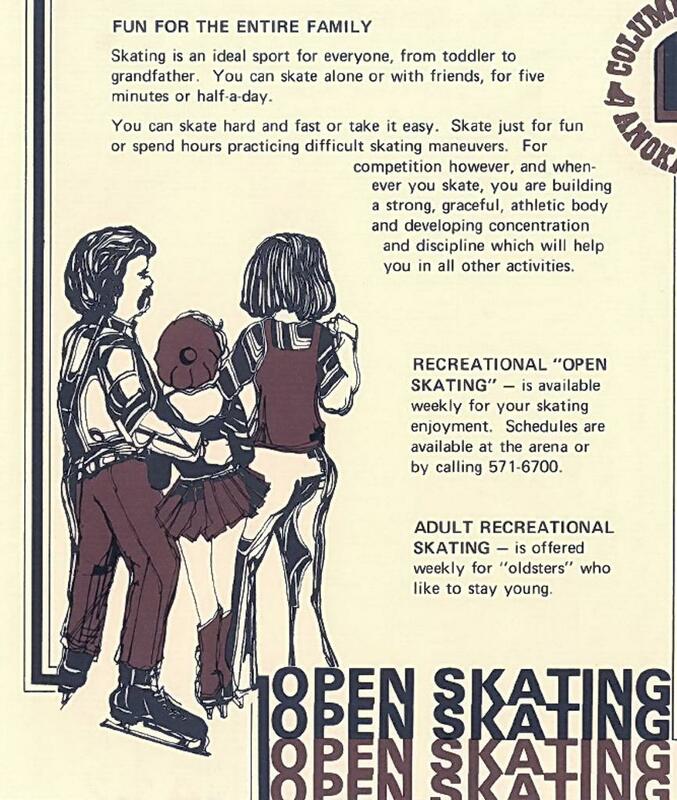 In addition several improvements were added to the original rink including a "Ice House" which was an all-purpose pro shop offering on-site skate sharpening, and hockey equipment and skate supply sales. 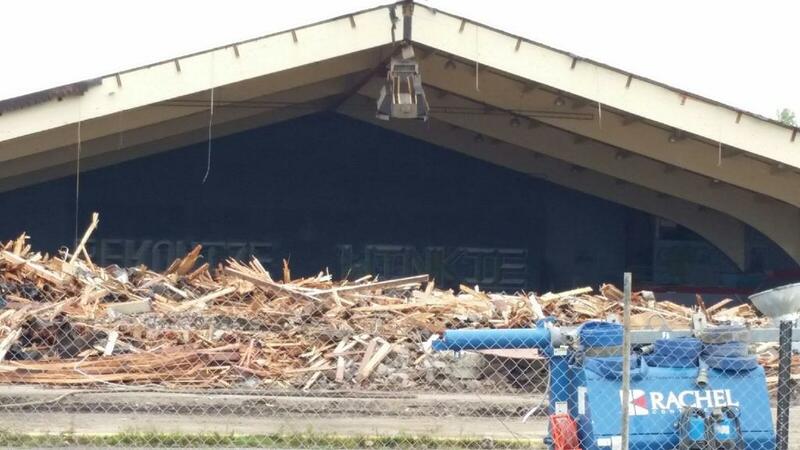 With the addition, it brought the entire complex to a 6 locker room(s), 2 showers, and 2 concession stands. 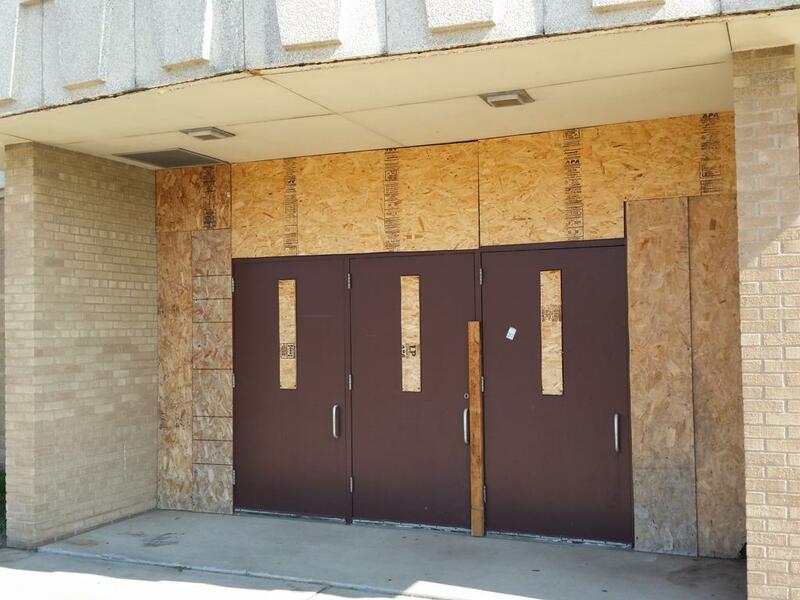 The building added a meeting room for use by area organizations, cable television and media room, and offices for administrative and facility usage. 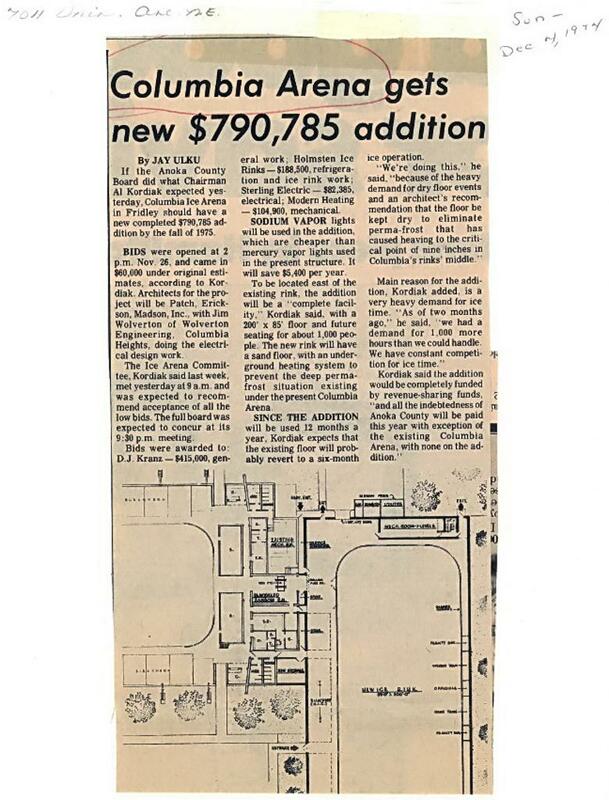 The 1975 addition and upgrades were completely funded by revenue-sharing funds. 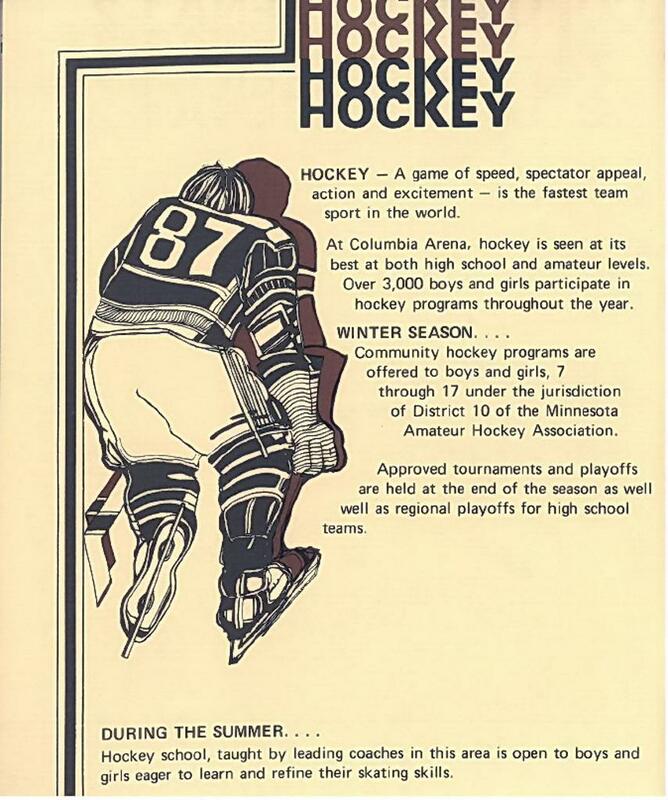 The arena was run and operated by Anoka County for all the years of the rinks operation. 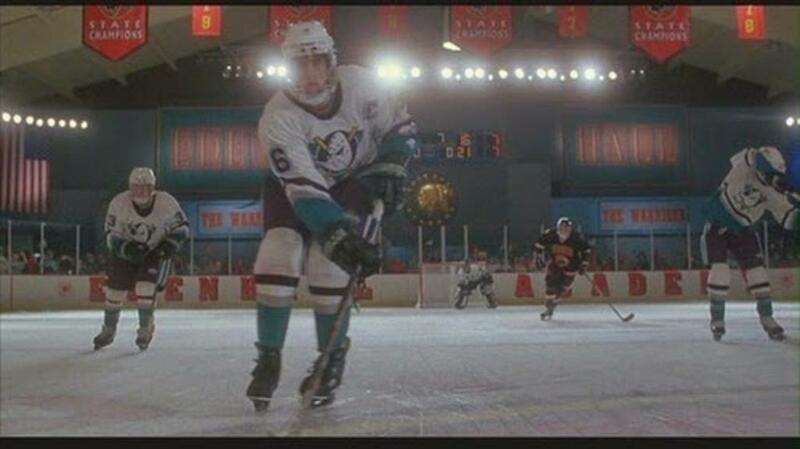 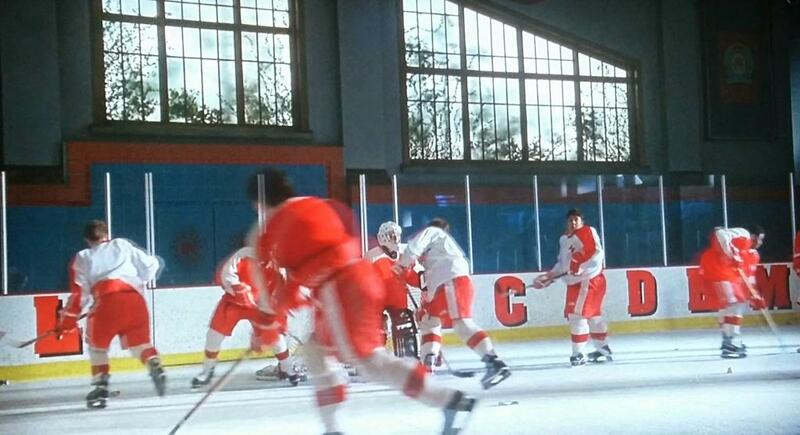 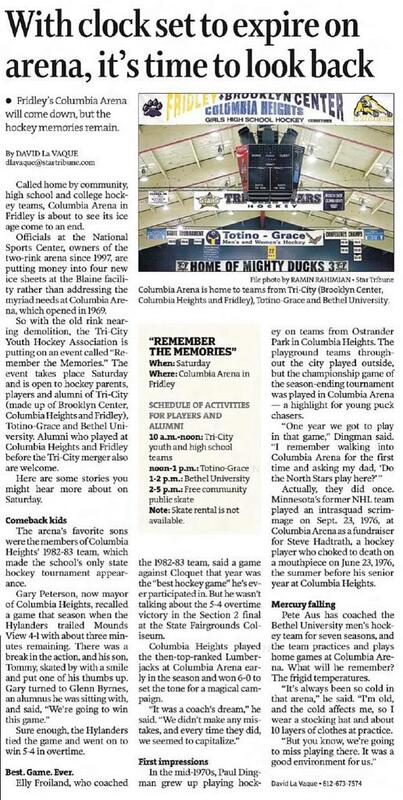 The arena had a brush with fame, D3: The Mighty Ducks, the third movie in the Disney hockey trilogy, was filmed almost entirely at Columbia Arena in the mid-1990s. 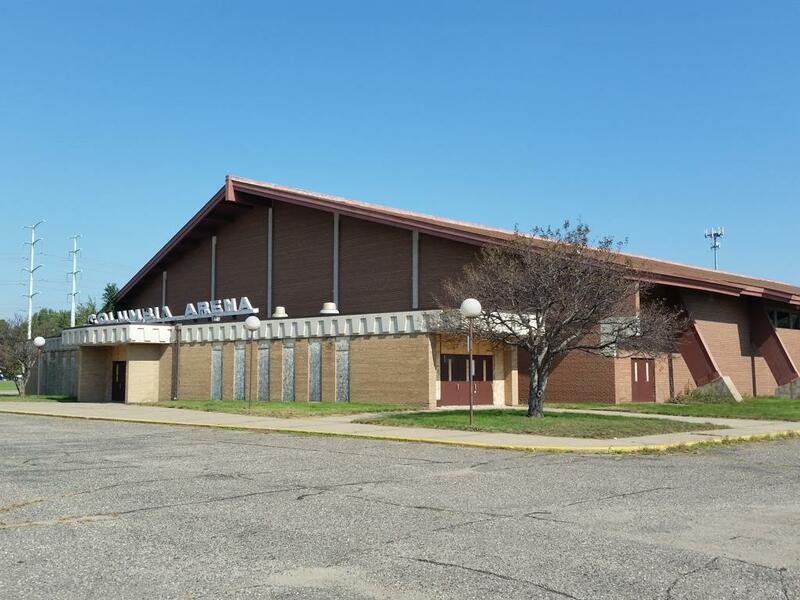 The Minnesota Youth Sports Association (MYSA) purchased the site in 2005 and decided in 2006 that it would need to invest approximately $2 million to redo the ice refrigeration and update the building to meet codes. 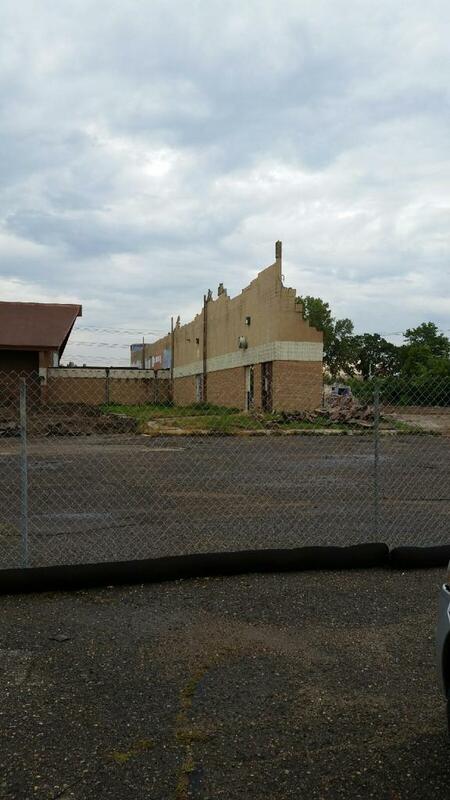 The building has been vacant since. 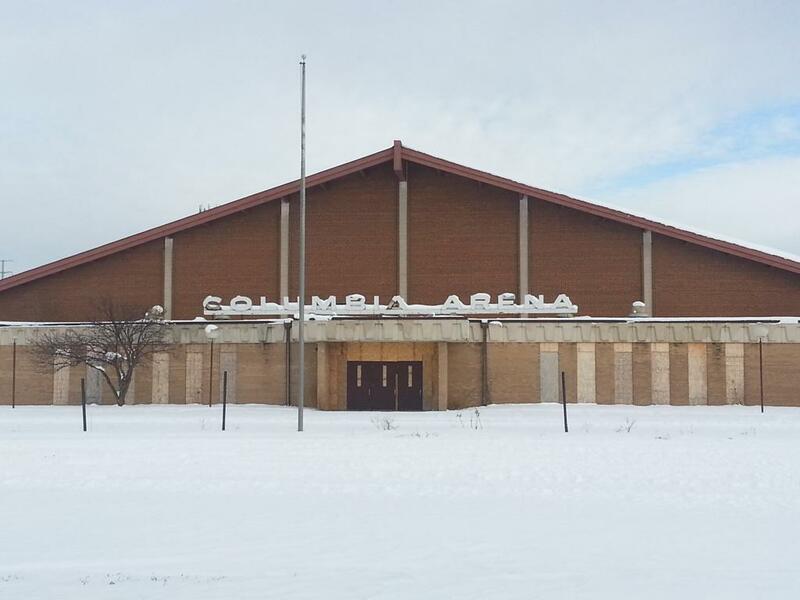 Instead of renovating the Columbia Arena, MYSA opted to add new sheets of ice at the National Sports Center (NSC) in Blaine, and awarded the Columbia Arena site to the contractor who won the bid to complete the ice addition at NSC. 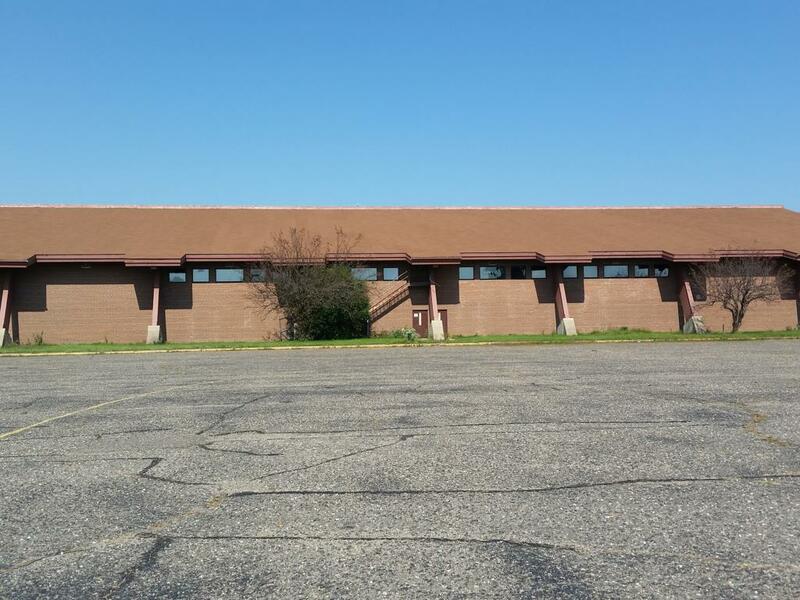 Kraus-Anderson, who won that bid, completed the Blaine addition and facilitated a sale to a private investor named William Fogerty, the owner of the property for years has considered several concepts, such as senior housing and medical offices, but nothing came to fruition. 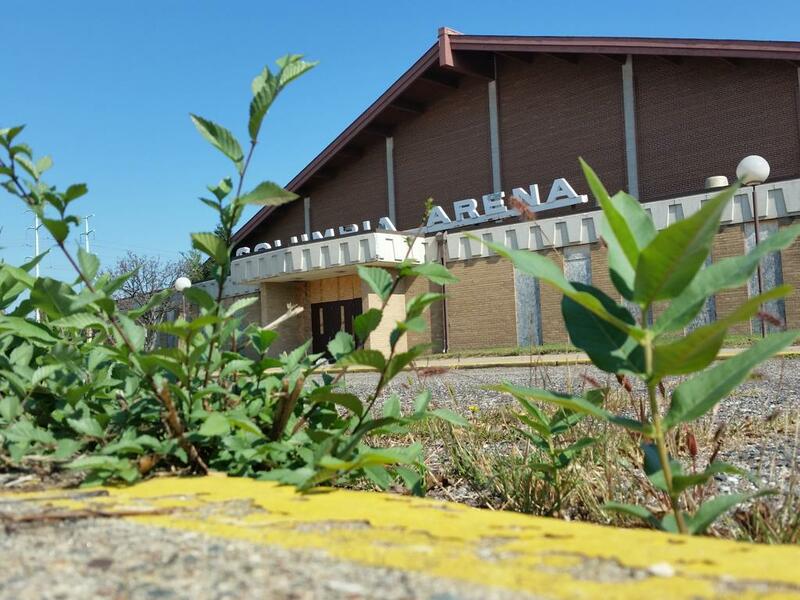 Because of its vacancy, the arena site was a target for redevelopment in the city’s 2030 comprehensive plan. 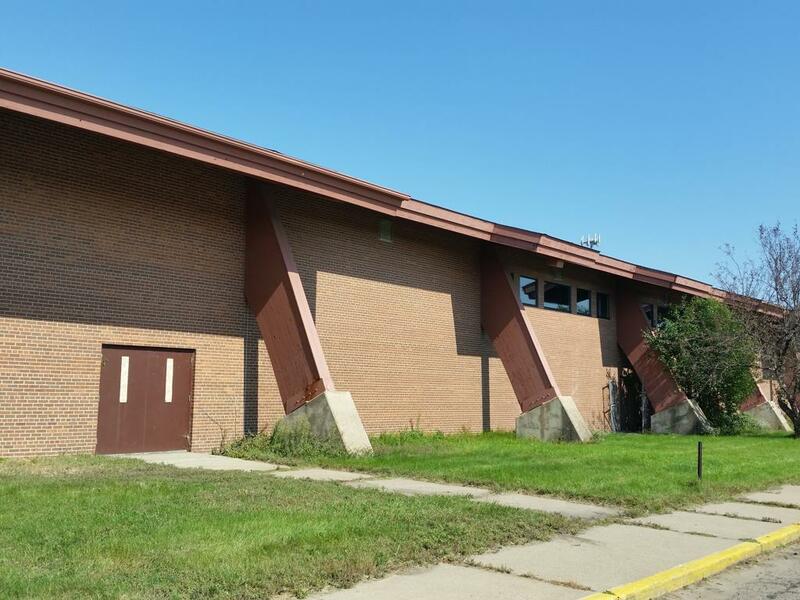 Additionally, approximately 8 percent of Fridley’s housing was of the townhome or condominium variety in 2009, but 23 percent of Fridley’s residents were over age 55 in 2000, according to a city survey completed for the 2030 comprehensive plan. 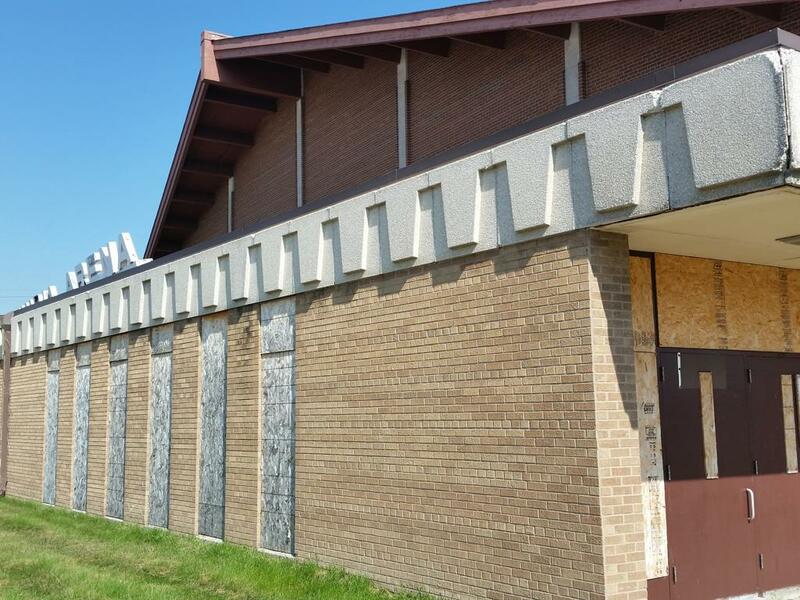 To allow Fridley residents to remain in the city and live in maintenance-free housing – without yard or house-exterior care – senior living facilities were desirable, according to city staff. 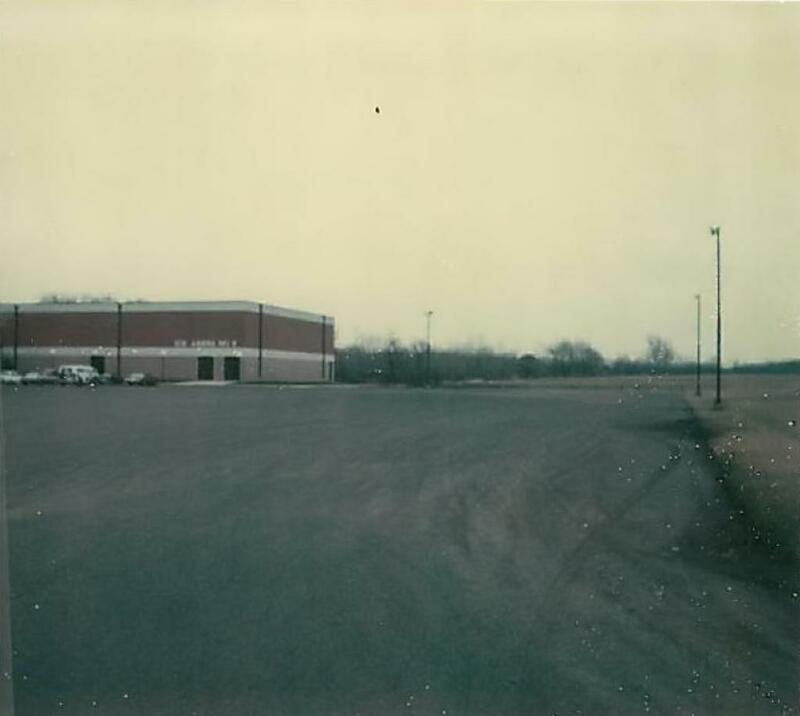 The site had been expected in summer 2009 to be home to the new Fridley Medical Center – now a part of the Unity Hospital campus – and a Walker assisted living facility. 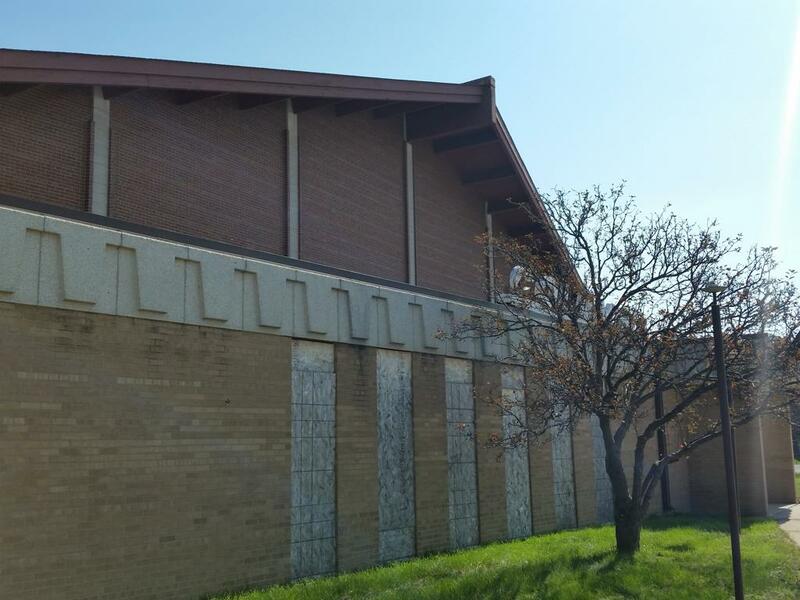 The four-story senior facility would have featured 176 total residential dwelling units. 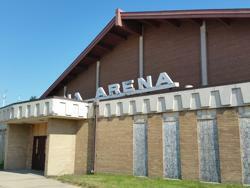 That plan was dismantled later in the fall of 2009 when Walker pulled out of the development agreement. 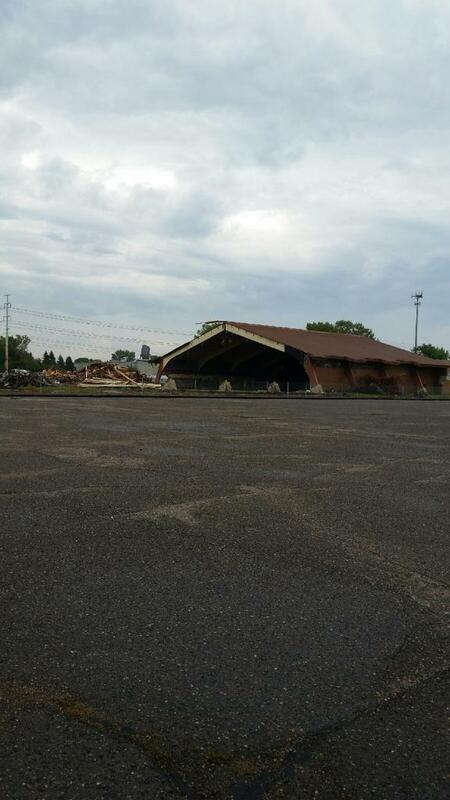 Fridley Medical Center management expected their facility on the Columbia Arena site to be completed by fall 2010. 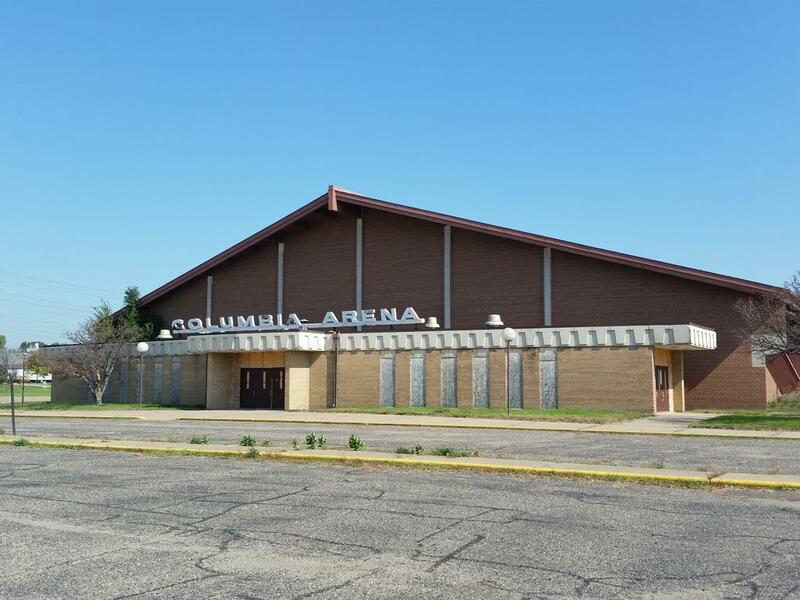 With time running out and the partnering developer backing out of the agreement, the medical center needed to find another location, and the Columbia Arena site remained vacant. 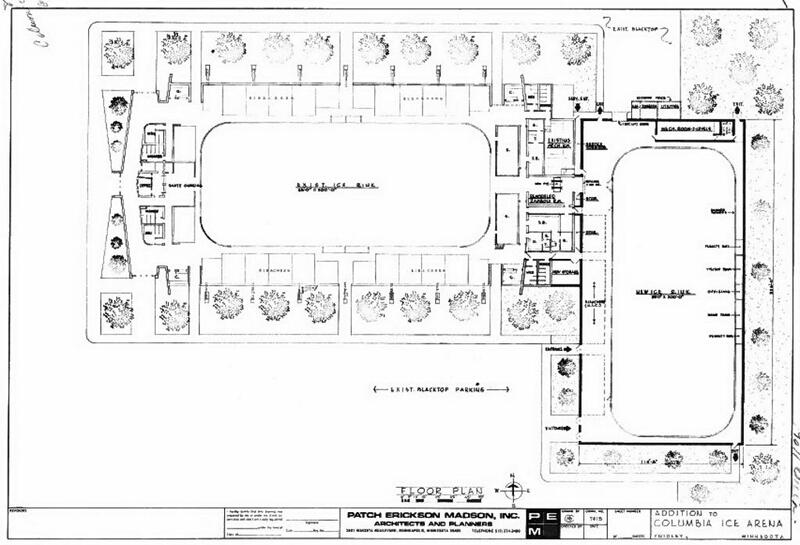 Community Development Director Scott Hickok said in October 2009 that the “good news” of the situation was that the attempted project did cause the site to be rezoned to multi-family, which allows for other types of developments, and “when times get better, we will get that project” that will be the right fit for the site. 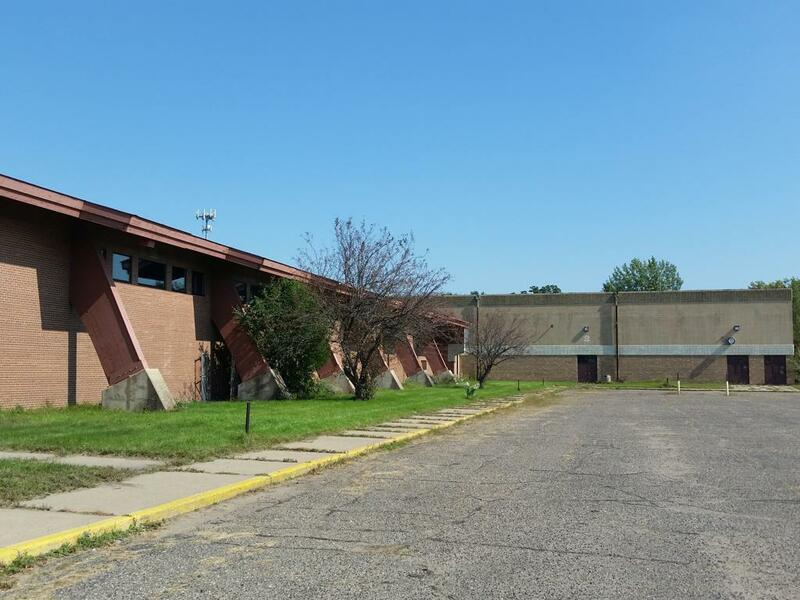 Another plan came forward in 2010 for an 84-unit senior living facility with independent, assisted living and memory care units. 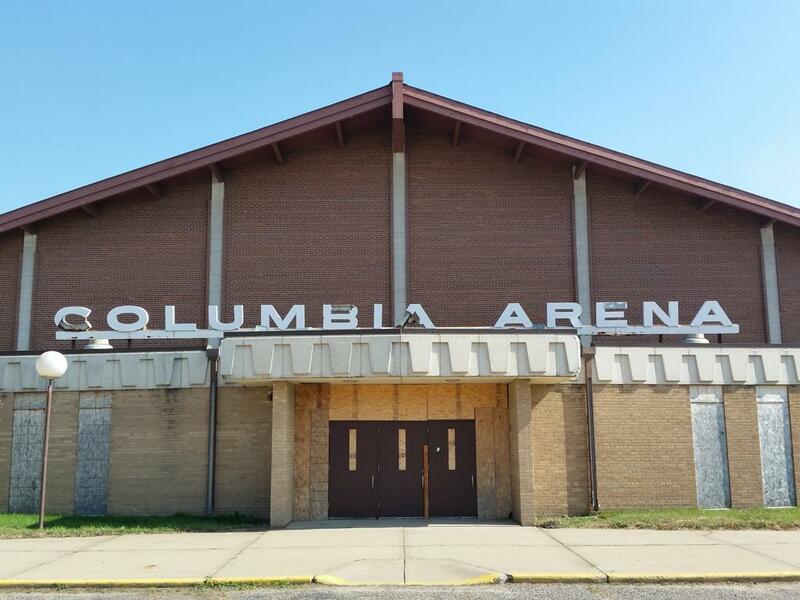 The facility would be in the remodeled Columbia Arena building, with some exterior changes. 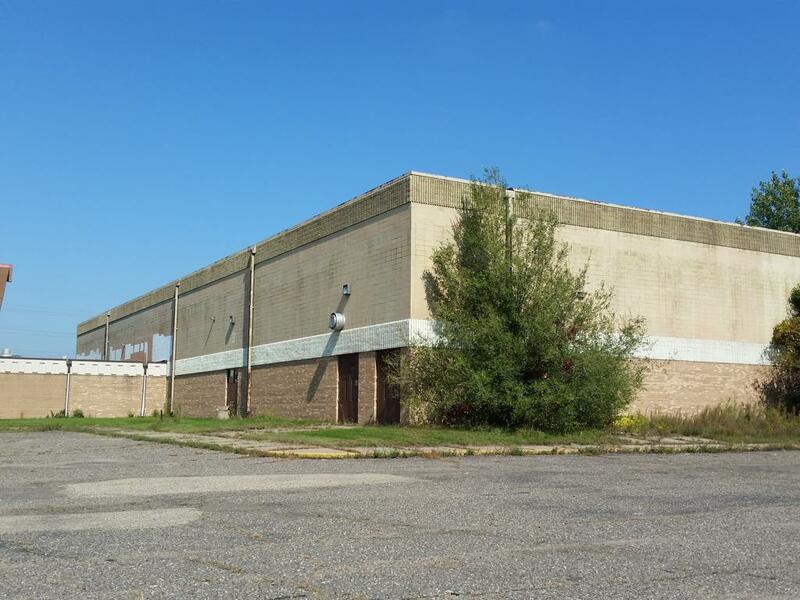 The property owner again had plans that the site would host a second, undetermined development. 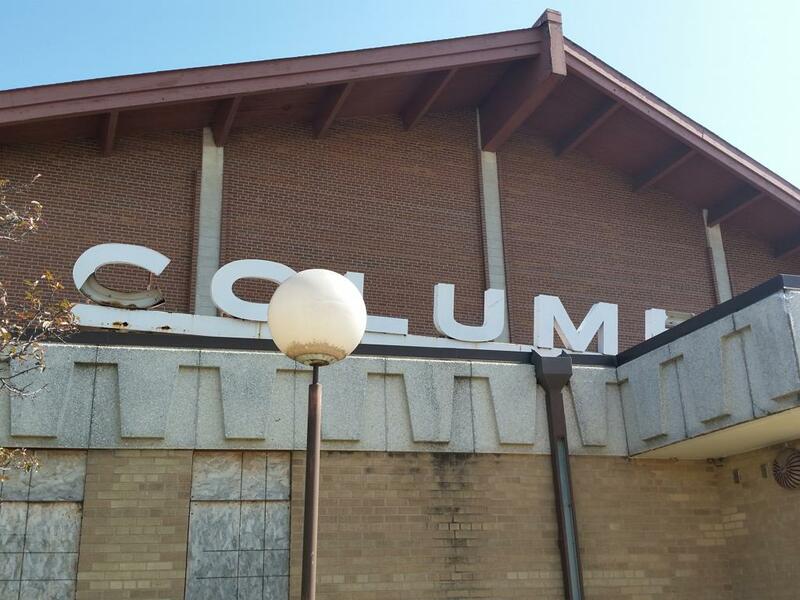 With no work started on the project as of December 2011, the property owner asked the City Council for an extension on the redevelopment plan to see if the original developers would be continuing in their plan. 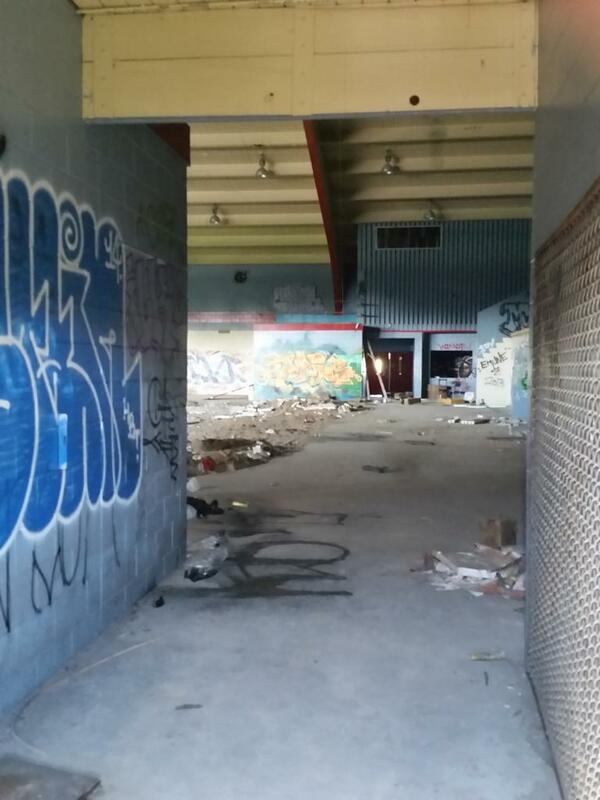 This project was also later abandoned and the site, again, remained unchanged, despite developers’ proposals. 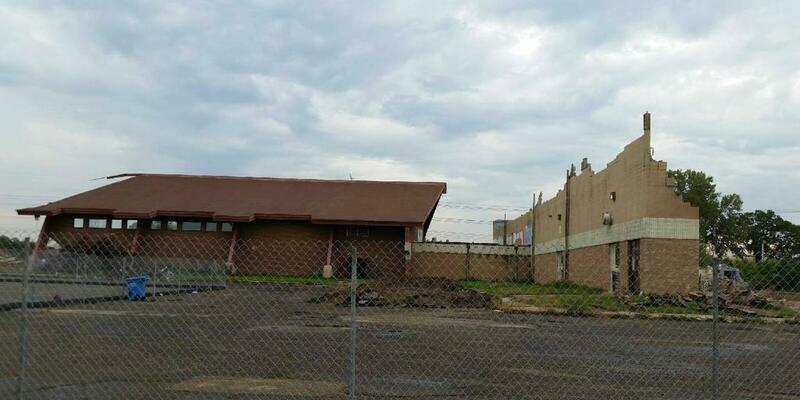 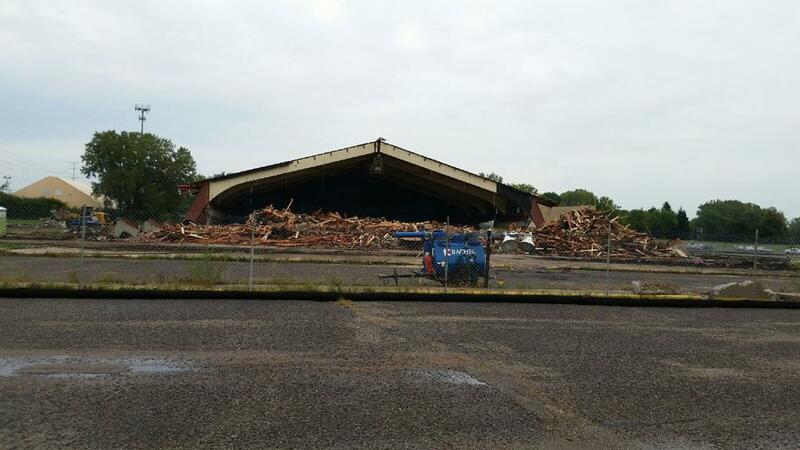 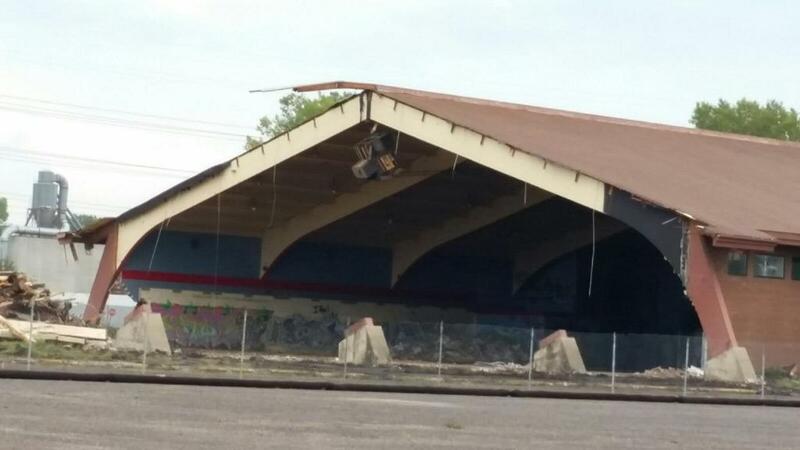 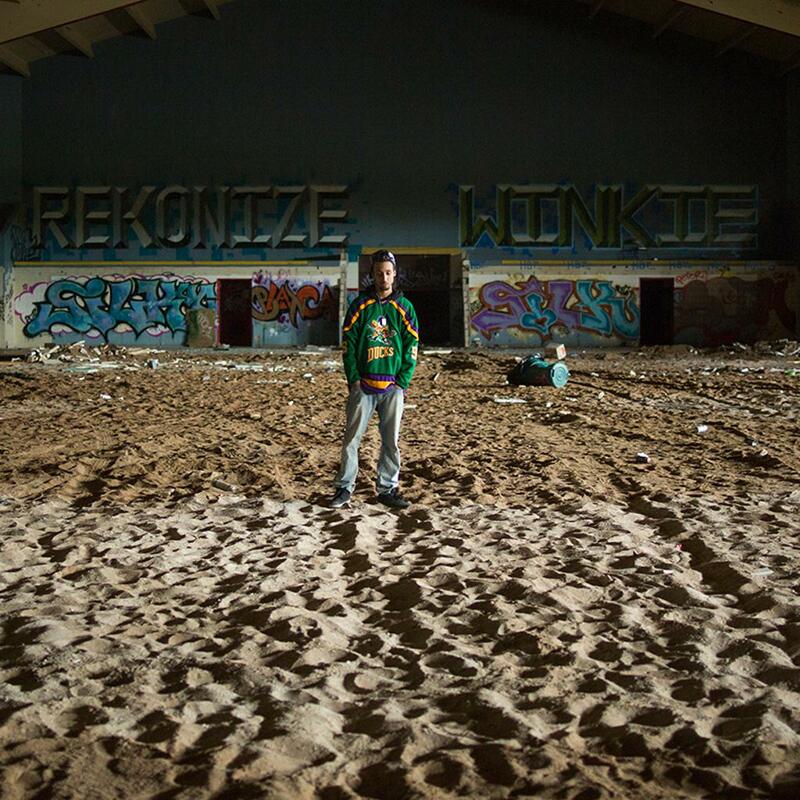 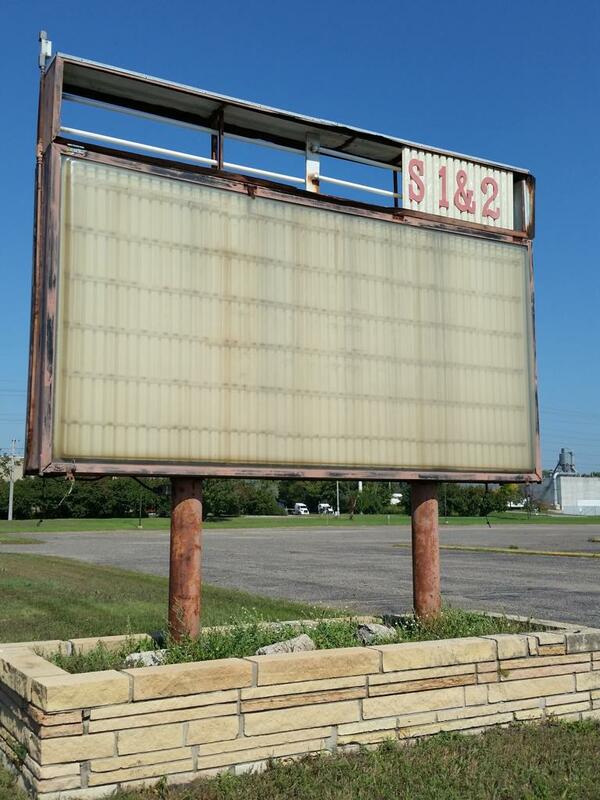 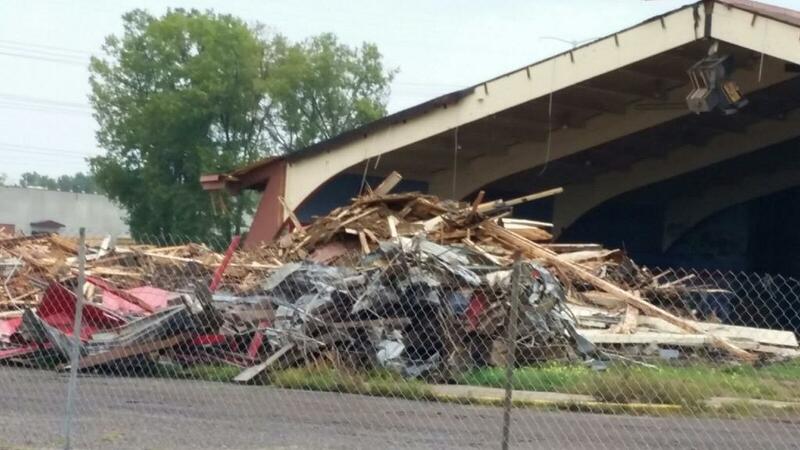 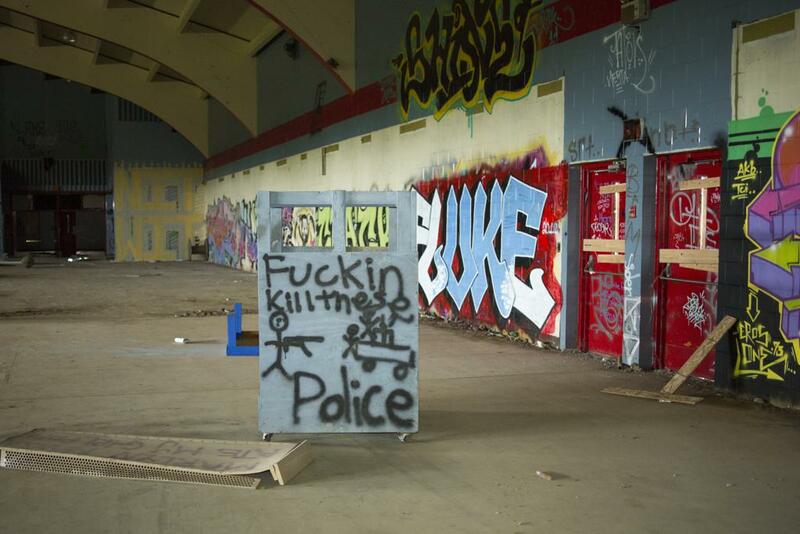 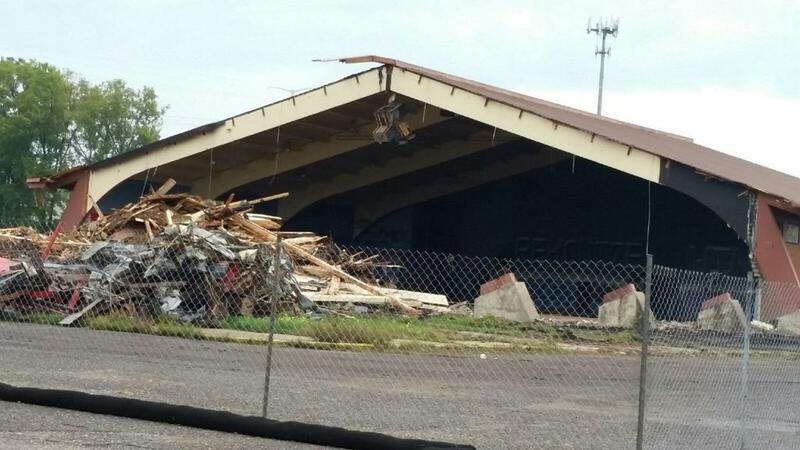 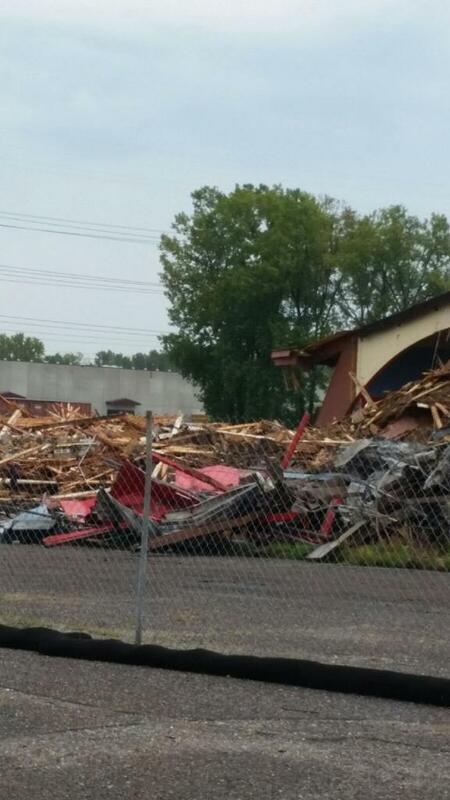 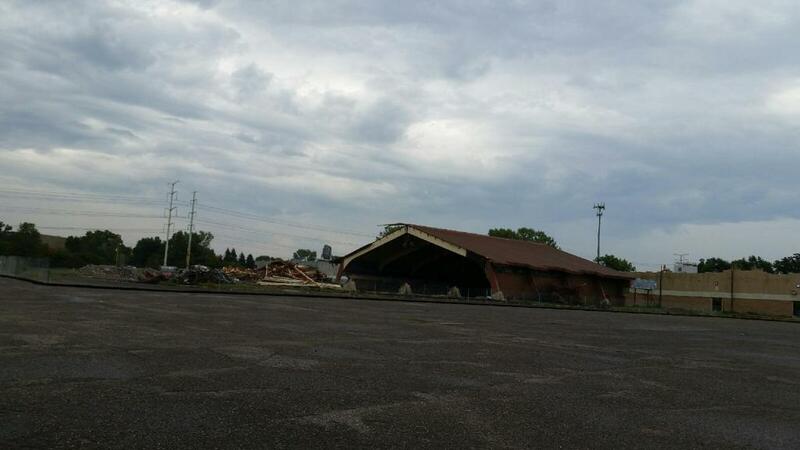 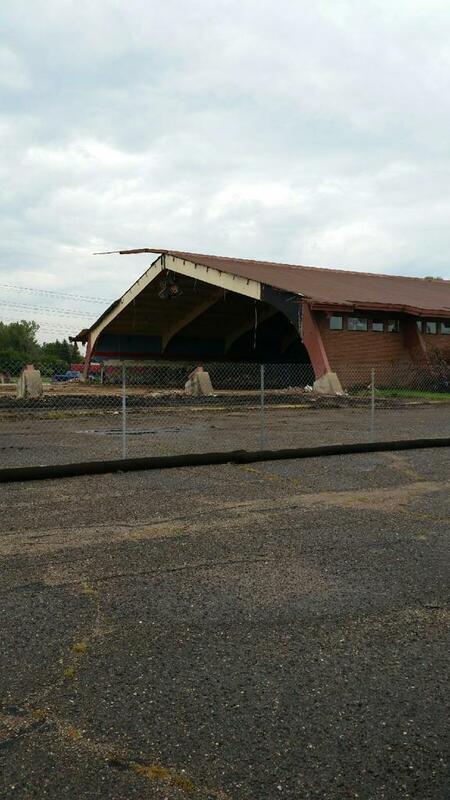 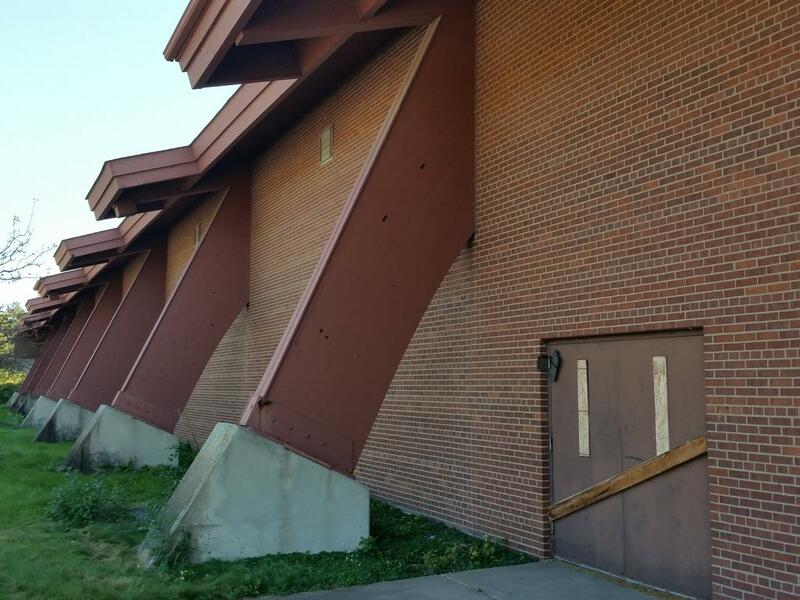 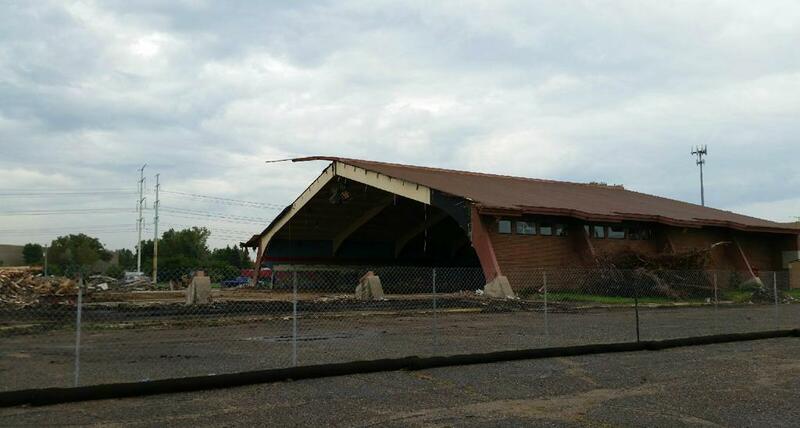 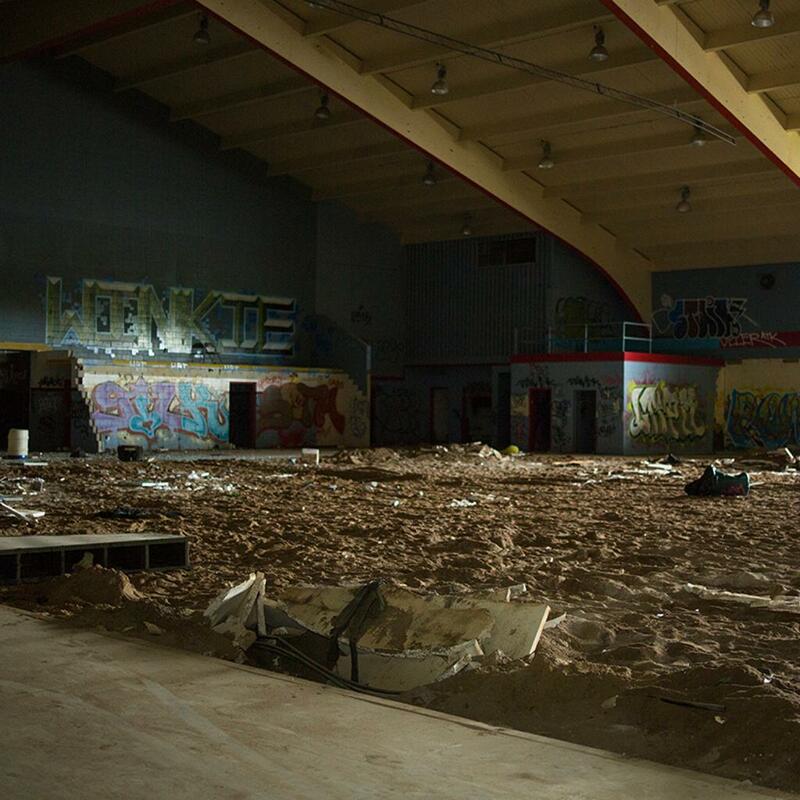 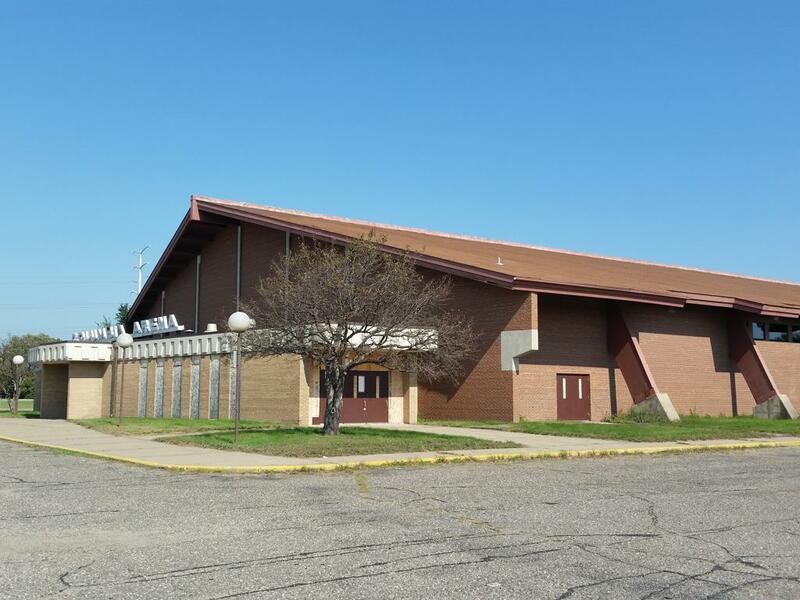 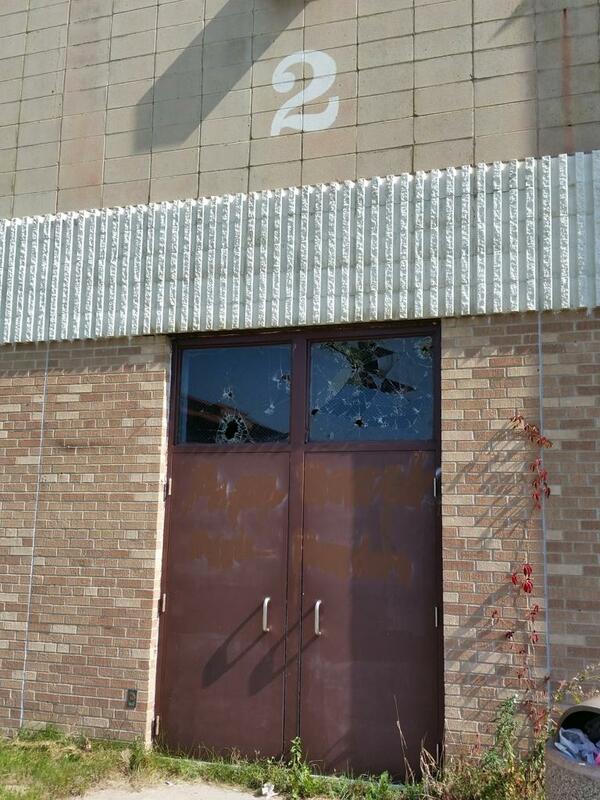 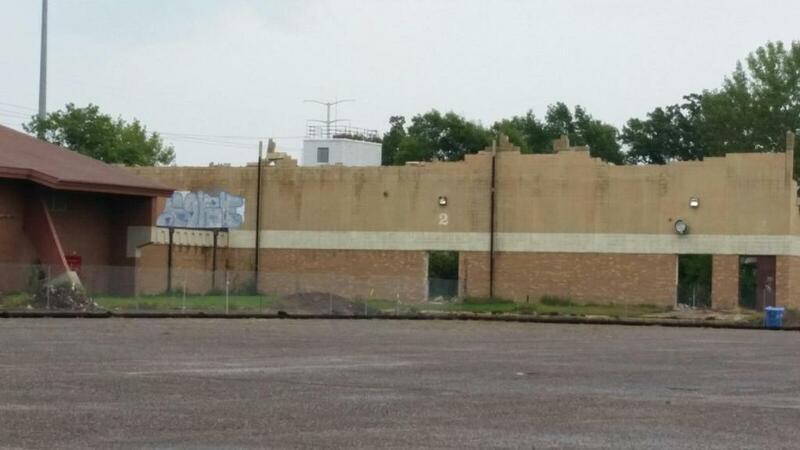 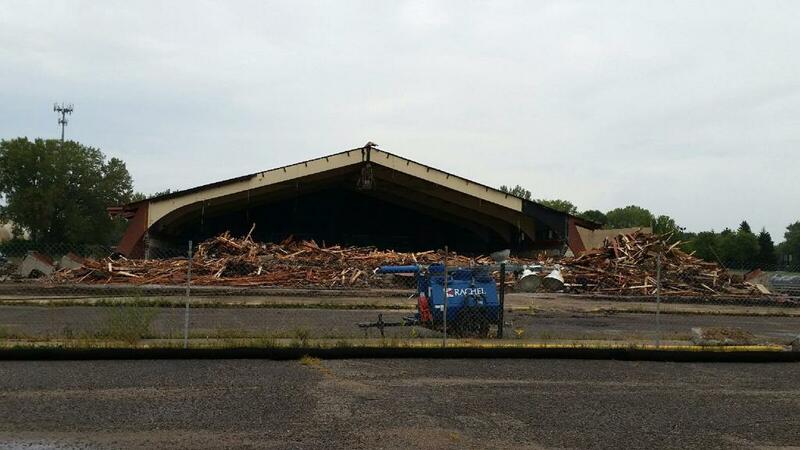 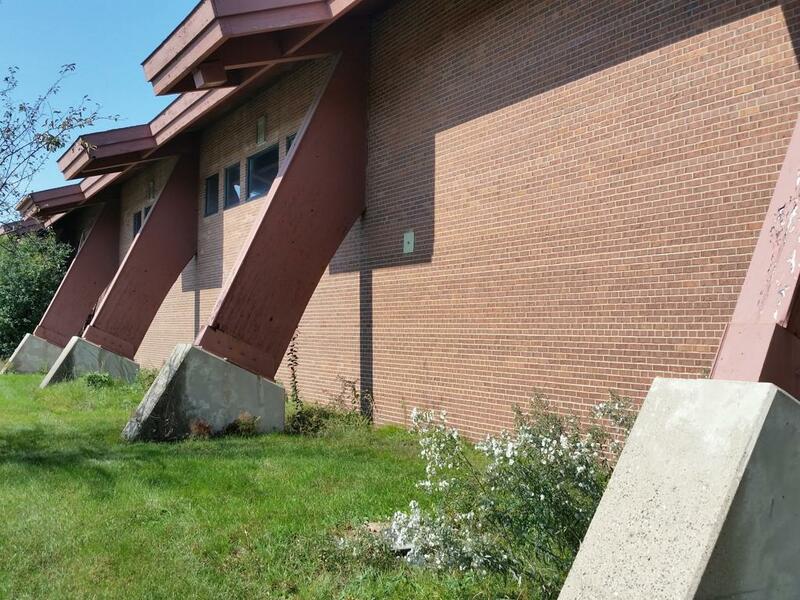 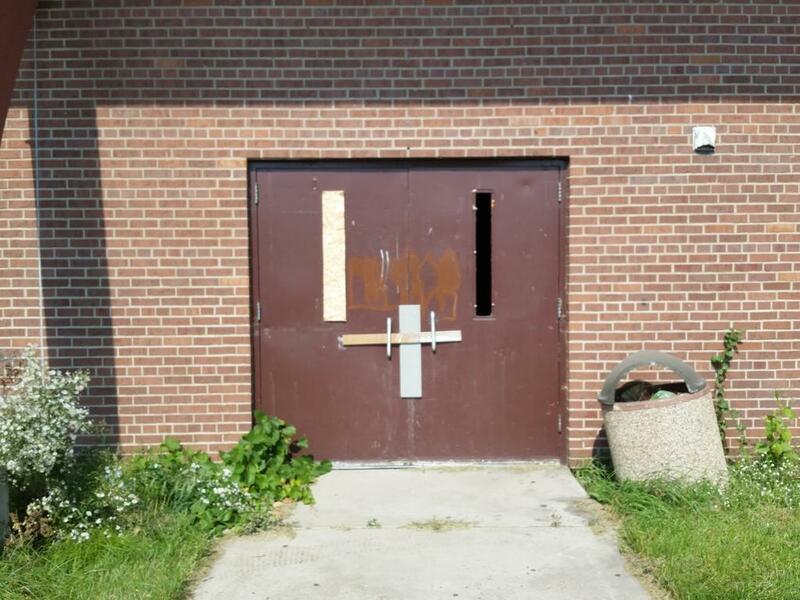 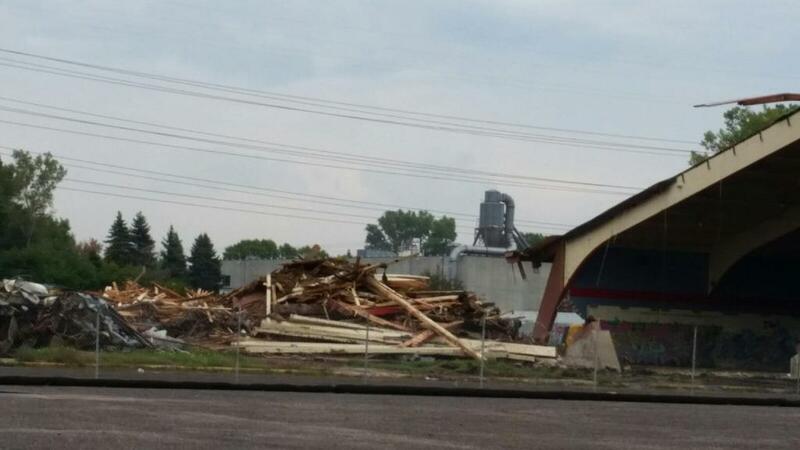 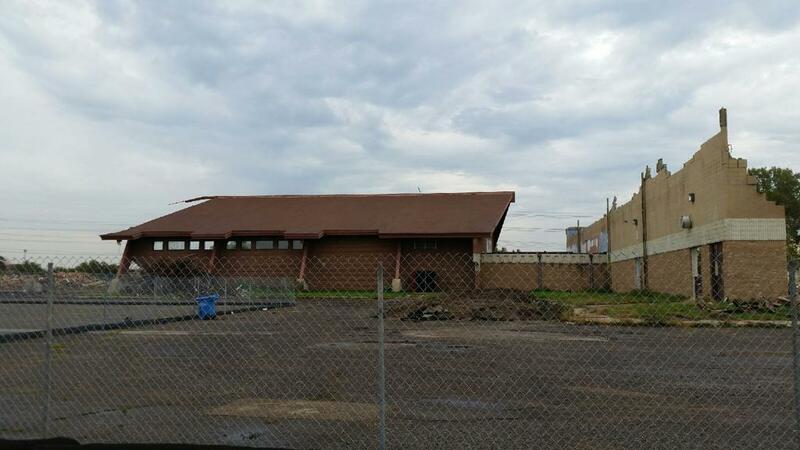 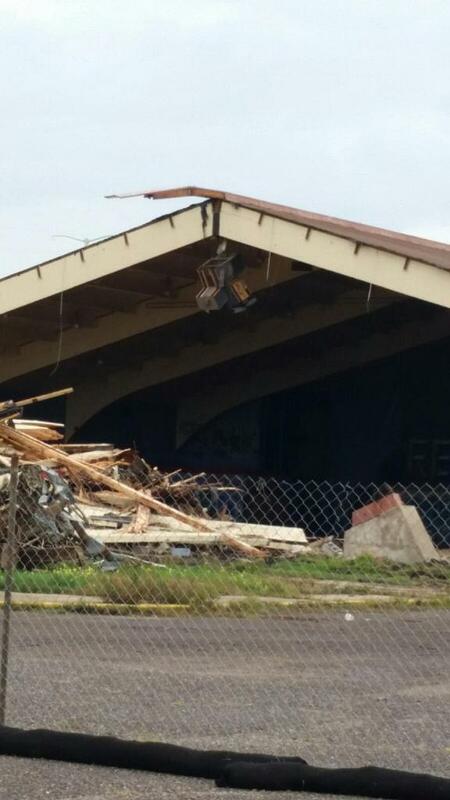 In September of 2014, with growing concerns and demands of the local residents to "remove the eyesore" in Fridley of the boarded up Arena, the City of Fridley purchased the dilapidated rink and was demolished beginning on September 23, 2015 for later development. 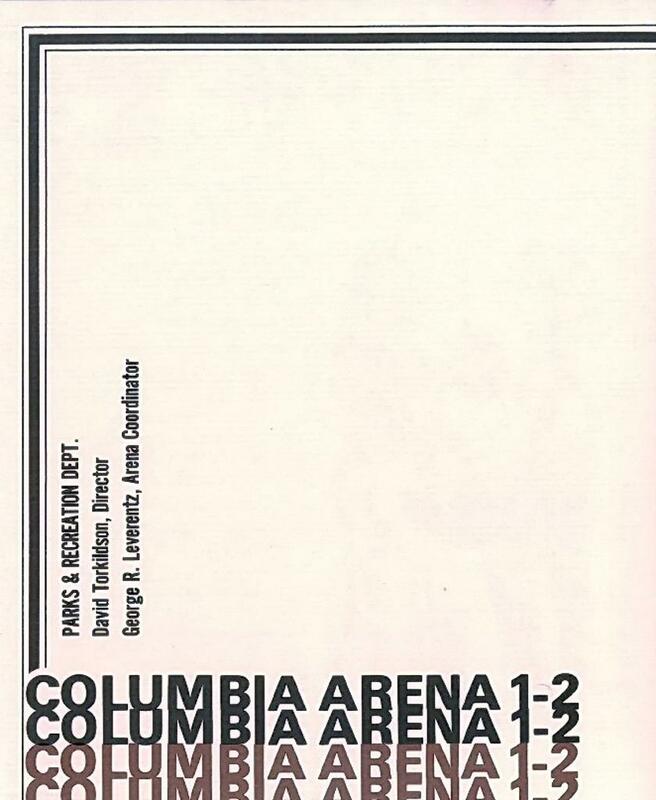 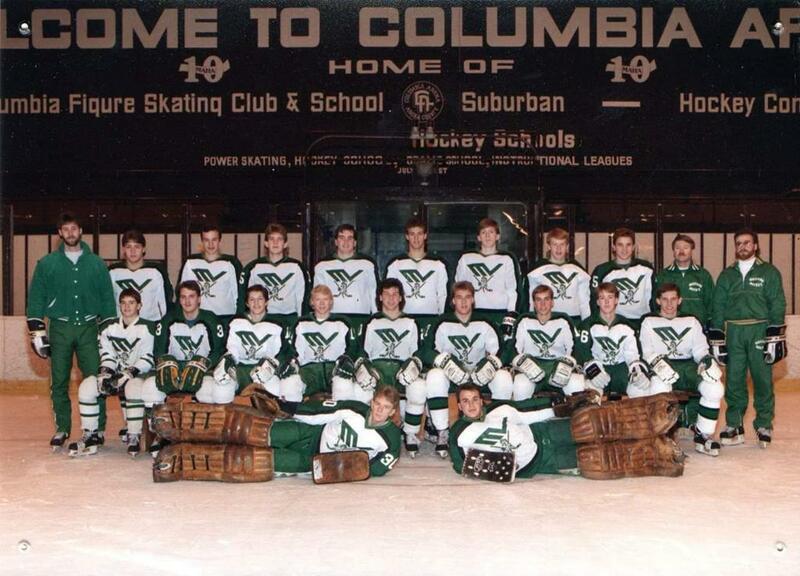 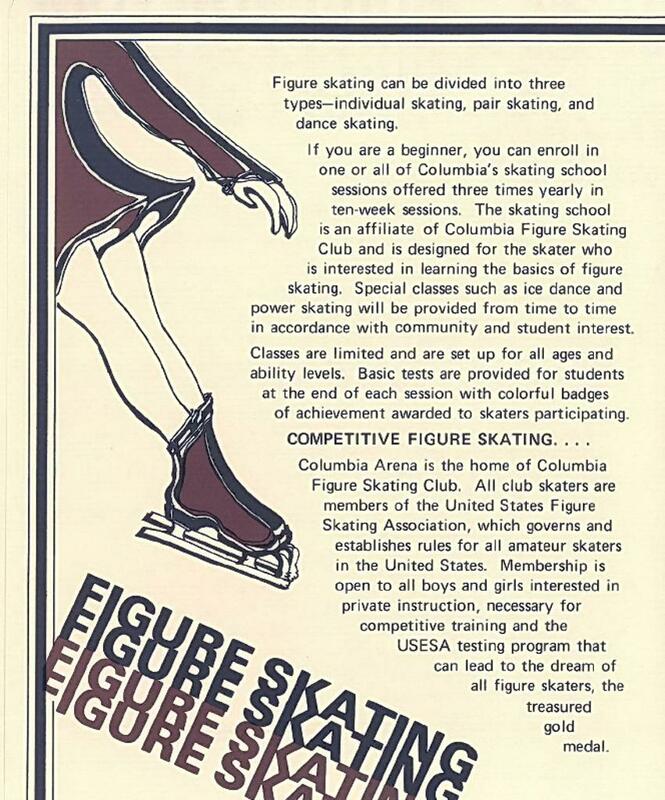 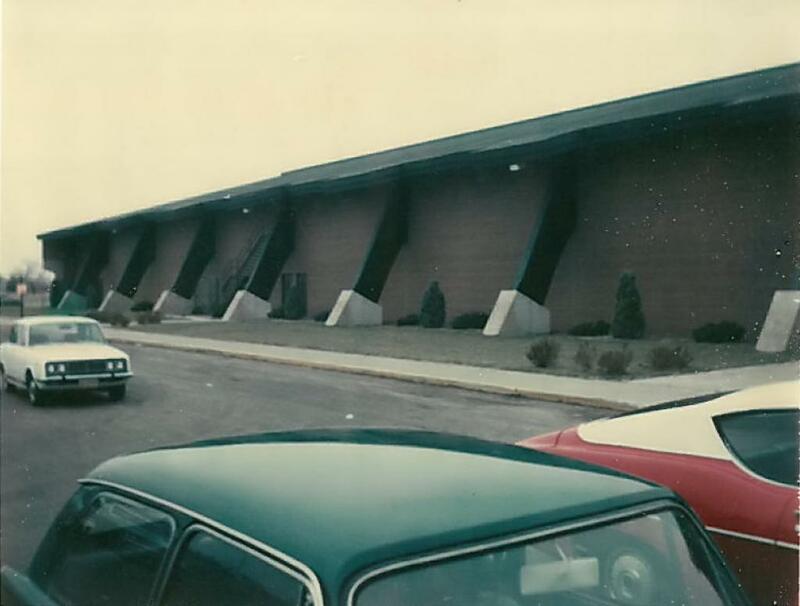 Columbia Arena was a major player in the suburban growth of youth hockey for 38 years until the National Sports Center additions at the Blaine Super-Rink were completed.